Attune to action: the snowpark Moreboards Stubai Zoo emerged as a hotspot of the international boarder scene during the last years. No wonder, the versatile boxes, jumps, rails and 3 kickers in line offer something for each difficulty level. The proper equipment is availavle at the ski rental of INTERSPORT Schönherr, city limit Neustift. Whether safety gadgets, trendy boards or binding check - the INTERSPORT Rent coaches know what it takes in order to succeed in cool performances on the snowboard. 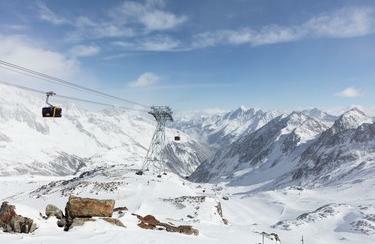 Also relaxation awaits you at the Stubai Glacier. You don´t believe it? The popular ski resort attracts by quiet comfortable slopes, whose advantages are especially appreciated by families and older skiers. The suitable material, that allows you to slide delightfully down the slopes, can be found at INTERSPORT Schönherr. The ski rental in Neustift is a specialist in high-quality ski equipment. The INTERSPORT Rent employees will actively support yoin finding exactly this winter sports equipment that fits your skill and style of driving. Get FREE information for your holiday in Neustift im Stubaital to your mobile!